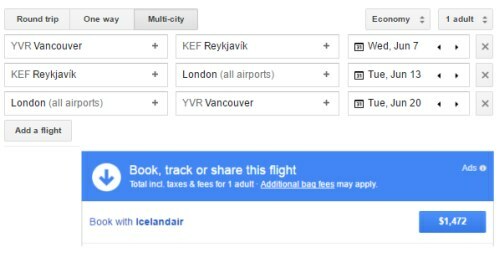 For example, let's say you're looking at a normal, roundtrip flight from Vancouver to London, UK with Icelandair. 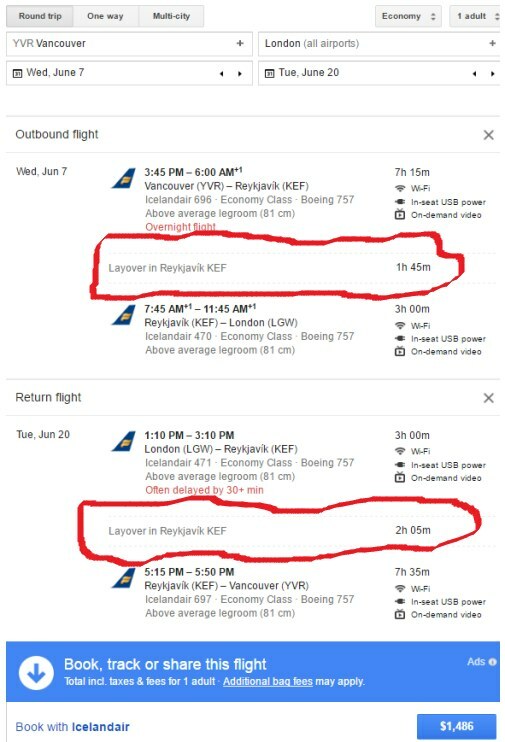 For example, Icelandair, as shown above, almost always offers free extended stops in Reykjavik, Iceland (KEF) - which is their hub, on your way from Vancouver to the European cities that they fly to (London, Paris, etc). Icelandair - Usually offers free extended stops in Reykjavik, Iceland (KEF) on your way from Vancouver to the European cities that they fly to. KLM - Sometimes offers free extended stops in Amsterdam, Netherlands (AMS) on your way from Vancouver to the cities in Europe, Africa, or the Middle East that they fly to. Air France - Sometimes offers free extended stops in Paris, France (CDG) on your way from Vancouver to the cities in Europe, Africa, or the Middle East that they fly to. British Airways - Has been known, on occasion, to offer free, or nearly free, extended stops in London, UK (LHR) on your way from Vancouver to cities in Europe. All Nippon Airways (ANA) - Has been known, on occasion, to offer free, or nearly free, extended stops in Tokyo, Japan (HND or NRT) on your way from Vancouver to cities in SE Asia. Qantas - Has been known, on occasion, to offer free extended stops in Los Angeles (LAX) or San Francisco (SFO) on your way from Vancouver to Sydney, Australia (SYD). 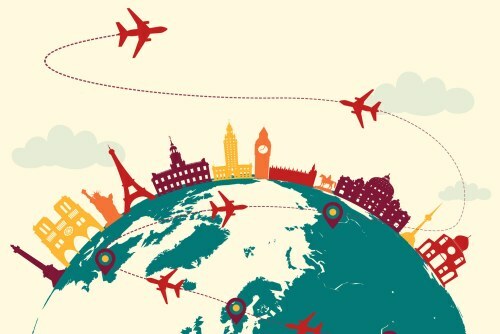 8 Responses to "How to book flights with free stopovers from Vancouver"
Wow, thanks Chris for this great info. I have tried doing it on my own and your system is much better. Now let's hope we can find one that has minimal cost increases!! We did this last year on trip to hong kong, took three-day stopover in Beijing with no additional cost. Two years ago another trip to hong kong on ANA stopping over in Tokyo called ANA directly. They allowed a three-day stopover with a $75 added fee. Doesn't hurt to call airline directly and ask. Awesome tips here Chris. You mentioned both the pros and cons which is the best. Your readers need to bear in mind that when things don't go well at the airport eg. slow and unclear, it's always a YMMV (your mileage may vary) situation. Things don't usually work themselves out without frustration and added stress. This ruin a vacation and as always, everyone's tolerances will be different. As for Japan. I'm not sure when you book on your own, but if you book through a Japanese travel agent (like HIS or IACE), and are flying within Japan, the stopover in Tokyo historically has been either free or $100 for us. So, if you are travelling to Kyoto,Fukuoka,Sapporo, etc through Tokyo, a few day stopover is pretty cheap. Also, if you book through a travel agent (like HIS or IACE) if you need a same-day transfer from NRT to HND for your flight, they will usually give you a bus transfer pass, which saves you $40 as well. Usually there's not a whole lot of value add using an agent if you have a simple itinerary. This is an exception to that rule. information I have read so far. Thanks and keep up the good work. Thanks Hanif! That is definitely appreciated, and thanks for checking out the site. We are flying to Europe in September on Air Canada. The routing is Vancouver to Toronto with a layover of about 2 hours and then on to Europe. I tried the multi city function and found that to stay over 1 night in Toronto caused the cost of my flight to almost double. I called Air Canada as was advised that that's what it is and offered no other solutions. Thanks Air Canada. Gouging?